« It’s the People I tell ya! We spent some time in St. Michael’s. It is a local cruisers hot spot and in some respects it was. But; in the respect of a full time cruiser it’s not! The place had a weird vibe to it. First we tied the dinghy up to the dinghy dock at the Maritime Museum. There we were told that to tie the dinghy up would cost $10 PLUS we both had to buy tickets to the Museum for a day! Another $32! $42 to tie the dinghy up! And at a Museum that is to focus on people using the water. Oh, we could have gotten a family membership for about $100 bucks; total cost, and then tied the dingy up each day for the 5 days we were there. YUCK! 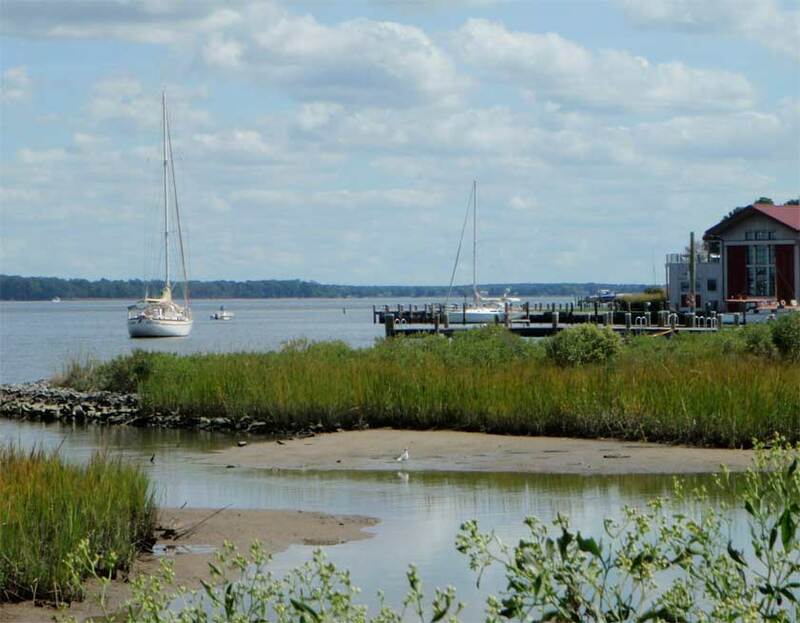 Although they’re said to be one of the best museums on the Chesapeake, because of their atttitude and support of boaters we just didn’t go there. The watermans Museums we’ve enjoyed most have been in Beaufort and Solomens. Saturday Mike and Jenny showed up on Namida; we rafted up and had a great time with them. We walked the town and found the back side entrance to St. Michaels. It wasn’t as crowded but entailed a 1/2 km dinghy ride to get to the dock and I know W/ would not want to row that too much. On the way there we discovered the laundry. The laundry is another important find for full time cruisers. The laundry is closed, as in out of business. There is no place in town for laundry except if you take a marina slip at St Michael’s Marina for; get this, $3.50 / foot on the weekends. That means to dock our boat and do the laundry we would be paying $147 / night. Now get this; they had a restaurant and if you wanted to eat at the restaurant and bring your boat you had to pay $10 / hour for the privilege of eating their food. They did have a washer and dryer. W/ asked if we could use them and the snooty dock master said “Maybe” if they’re not crowded during the week. Oh’ they’re so special. NOT! Obviously we didn’t eat there or dock there. But there was a silver lining, Justines. They had listed on their menu that the Shakes and Malts were the Best in the Chesapeake. And indeed they were. I had one every day. Fortunately; we didn’t stay long enough so I won’t be in need of my Red Suit come Xmas. This entry was posted on Tuesday, September 22nd, 2009 at 5:53 am	and is filed under Deck, Places. You can follow any responses to this entry through the RSS 2.0 feed. Both comments and pings are currently closed.